We’d love your help. Let us know what’s wrong with this preview of Dungeons and Dragons Art and Arcana by Kyle Newman. From one of the most iconic game brands in the world, this official DUNGEONS & DRAGONS illustrated history provides an unprecedented look at the visual evolution An illustrated guide to the history and evolution of the beloved role-playing game told through the paintings, sketches, illustrations, and visual ephemera behind its creation, growth, and continued popularity. To ask other readers questions about Dungeons and Dragons Art and Arcana, please sign up. Nataliya Nechukhayeva Mine is ok, my husband bought it for our sons. And I realy enjoy reading. Now, it’s entirely possible that you may disagree with that (factually correct) contention, which I, in my benevolence, will allow. But, what you cannot deny is the outsize influence the game, despite a relatively modest number of players in relative terms (relative to, say, Fortnite), has had on mass pop culture. Sure, the game alone is not responsible for the dominance of the fantasy genre across movies, games, and books (some dude named Tolkien, for example, probably deserves at least a little credit), but D&D’s DNA is writ large across any number of wildly popular multiplatform creative properties—due primarily to the fact that the creators of many of those wildly popular works honed their own storytelling chops while hunched over snack-strewn tabletops covered with dice, hexagonal graph paper, and dog-eared rulebooks. Art & Arcana celebrates an extraordinarily imaginative and collaborative game with a dazzling array of visuals that show the game’s evolution from a home-brewed labor of love to a corporate brand name to something that seems to have struck the ideal balance between money-making concern and passion-fueled platform for shared storytelling, imaginative forays into distant worlds, and social inclusion. Even for someone who thinks in words like yours truly, seeing the art of D&D evolve from moderately skilled black-and-white sketches wherein anatomical correctness was more of a guideline than a rule to magnificently drawn, masterfully painted masterpieces that you can easily get lost in made for hours of entertainment. As much as I enjoyed the art, however, I may have enjoyed the narrative even more, tracing the arc of D&D’s development from Gary Gygax’s basement to the hallowed halls of Wizards of the Coast. With hand-drawn maps from Gygax’s own game complementing the chronicle of how D&D slowly made its way across the country and around the world, I couldn’t help get nostalgic for the days before cable and the internet when a game like D&D provided the kind of creative, fantastical escapism you couldn’t get anywhere else, even if I never, you know, actually lived through such days* (I mean, I lived before the days of the interwebs, of course, but by the time I became a savvy connoisseur of pop culture in the mid-80s, technology had advanced leaps and bounds from the days of D&D’s infancy). An absolutely essential read for all D&D enthusiasts, and highly recommended for those thinking about dipping a toe in the shimmering waters of pen-and-paper RPGs: if this doesn’t fire your desire to break out some polyhedral dice and slay some orcs, nothing will. Don't let the visual history fool you, this is a fairly thorough history of Gary Gygax, D&D, TSR, etc. From basement game play to corporation to being bought out with all the rollercoaster ride that implies. The compilation of visuals include illustrations from the various guides from the onset booklets to the hardcovers to the floppy disks to the CD Roms and all the editions as well as some fun odd bits like a belt buckle to a pin. So, from an information and chronicle approach this works w Don't let the visual history fool you, this is a fairly thorough history of Gary Gygax, D&D, TSR, etc. From basement game play to corporation to being bought out with all the rollercoaster ride that implies. The compilation of visuals include illustrations from the various guides from the onset booklets to the hardcovers to the floppy disks to the CD Roms and all the editions as well as some fun odd bits like a belt buckle to a pin. So, from an information and chronicle approach this works well, and you can really see the different trends just from the artwork. That said, I think you probably need to have some emotional connection to D&D or gaming history interest to get into this. Personally, I hit D&D in the second wave when an older sibling brought it back from college. So, I had the first set of harcover manuals. I thought the origin of the game out of military miniatures and warfare super interesting since I had no knowlege of it. I also found the later manifestation of the rules bizarre as TSR went through growth, expansion, and finally being bought out by the founders of Magic, which is a clear derivative of D&D. While reading this I got to see the hardcover collectors' edition, and it is spectacular. Far more satisfying than an ebook and worth the money with all the extras: prints and the infamous Tomb of Horrors. This then turned into the discussion of which versions everyone in the room was familiar with, unearthing of hand-painted figures and guides from eons ago, confessions of favorite parts of the game and challenges--getting everyone to commit to a time and place. I guess the online forums have helped people with that. For me, the cartography was my favorite part. The interior art of the game was just as good, with Elmore and Jeff Easley adding flavour to the content. I read the books over and ove When I hit the D&D hobby in 1984 there was one image that burned into my brain, an image that called out to my imagination and set the tone for my fantasy tabletop gaming for years to come. It was the Larry Elmore cover of the Red Box D&D Basic Set. The warrior lunging forward as the dragon protected its hoard; it was colourful, dynamic and inspirational. This is exactly what it says it is: a history of Dungeons and Dragons with loads and loads of art. The history itself was ok. Anyone that is involved in the hobby probably won't find too much here that will surprise them, although it is extremely comprehensive. Gary Gygax, the satanic panic, the oversaturation of settings in the 90s, the edition wars, the magazines, software, dice games, card games, cartoons, toys, PC games, handheld games, etc. etc. etc. It's all here. Something that I did lear This is exactly what it says it is: a history of Dungeons and Dragons with loads and loads of art. The history itself was ok. Anyone that is involved in the hobby probably won't find too much here that will surprise them, although it is extremely comprehensive. Gary Gygax, the satanic panic, the oversaturation of settings in the 90s, the edition wars, the magazines, software, dice games, card games, cartoons, toys, PC games, handheld games, etc. etc. etc. It's all here. Something that I did learn from all of this history, however, is that actor and notable cool dude Peter Cushing was an avid miniatures painter and wargamer. I guess that's how Grand Moff Tarkin was so good at strategy. What I came to see, however, was the art, and this big cinder block of a book doesn't disappoint. Of course you are going to get the standard art pieces that are in every D&D art book: the covers of the books/boxed sets, the interior pieces, etc. This art, of course, covers all editions of D&D from when it was being hand assembled in small batches all the way to 5th edition. What you also get, however, is draft pieces and sketches, advertisements, photos (including one of famous Van Helsing enthusiast Peter Cushing playing with his miniatures), notes and scrawlings from artists and designers, and so much more. This had me in full throttle geek mode from start to finish. It's probably the best book in the world. Art & Arcana is a stunning visual history of Dungeons and Dragons. It's got all of the famous art that you'd expect to see, much of it drawn from the original sources, without branding. It's also got beautiful comparisons of a variety of sorts and great art drawn from many licensed materials, from comics and cartoons to miniatures and computer games. The gorgeous, careful layout and the high-quality printing show all of this off perfectly. There's also a written history here that's good. It d Art & Arcana is a stunning visual history of Dungeons and Dragons. It's got all of the famous art that you'd expect to see, much of it drawn from the original sources, without branding. It's also got beautiful comparisons of a variety of sorts and great art drawn from many licensed materials, from comics and cartoons to miniatures and computer games. The gorgeous, careful layout and the high-quality printing show all of this off perfectly. There's also a written history here that's good. It doesn't go into great depth, but it certainly does a great job of hitting every major point in the history of D&D and covers lots of things that the average D&D player won't know. It really shines (unsurprisingly) when talking about the artists, revealing who these people that helped to create the game were. I also found the later parts of the book, covering 3e, 4e, and 5e, quite insightful in their analytical analyses of why Wizards made their decisions for those editions. A monstrous look at 45 years of Dungeons & Dragons art, everything from the historic predecessors to components from every version up through today, along with virtually every aspect of the licensing it's seen the entire time. Not only do we get a history of D&D as a product and how it evolved and was both directed by and from it's artwork, but we get insights on the creators, modern stewards, and companies themselves. Being a licensed book this isn't just a glowing representation of how A monstrous look at 45 years of Dungeons & Dragons art, everything from the historic predecessors to components from every version up through today, along with virtually every aspect of the licensing it's seen the entire time. Not only do we get a history of D&D as a product and how it evolved and was both directed by and from it's artwork, but we get insights on the creators, modern stewards, and companies themselves. Being a licensed book this isn't just a glowing representation of how awesome things are, they wax nostalgic about the heydays and deride low points of course, but also never shy away from competitors that they influenced and were influenced by. Pathfinder, World of Warcraft and yes, Wizards of the Coast taking over TSR are all given lengthy discussion, but so is how details the maps can be and how wacky those monster are. As a collection of art, it's fantastic, but the extra details about it and story within just elevates it all into one of the best art related books of it's kind I can recall, though the history aspect alone does most of that legwork. A history of D&D. Heavy emphasis on the visual elements. Man, that early art was cheap and amateurish. Sometimes fun, to be sure. Picks up as it goes on. Also, there are maps, which gives me deep philosophical thoughts about the way dungeon crawls would be hard to make a novel out of. . . you would have to write a trilogy to cover every room in a single page. This is a tricky one to review. As an artistic history of D&D, it's almost flawless, but the text is a dry and cursory telling of the story thus far. For what is essentially the biography of a game, there are almost no discussions of the mechanics and ideas of its gameplay. while the crunchy stuff may not mean much to a casual consumer, I don't think this book is aimed at the casual market: Big, expensive coffee-table/conversation-piece books rarely are. While the text is lacking, this is an This is a tricky one to review. As an artistic history of D&D, it's almost flawless, but the text is a dry and cursory telling of the story thus far. For what is essentially the biography of a game, there are almost no discussions of the mechanics and ideas of its gameplay. while the crunchy stuff may not mean much to a casual consumer, I don't think this book is aimed at the casual market: Big, expensive coffee-table/conversation-piece books rarely are. While the text is lacking, this is an art book. As such, it's amazing. While the early D&D art was crude, the evolution is great to see, piece by piece. The layout, with its asides and showcases, also delivers mightily. 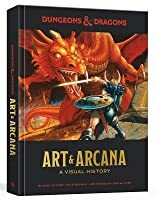 I absolutely loved flipping through this gorgeous book of art from the 40+ year history of D & D. It does an amazing job of highlighting the contributions that hundreds of people have made to this game, and the ways it has sparked so many people’s imaginations. I’m very interested in this game as a creativity engine, and I’m looking forward to playing more in this world next year. Brilliant and beautiful history of the world's greatest role playing game. 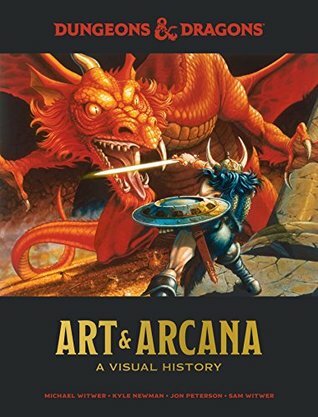 A beautiful book, full of D&D art and some of the game's history. The history part is not very deep and does not go into a lot of detail or human stories, but this is less of D&D's biography and more of "look at the pretty pictures" within context. Highly recommended for those interested in the Art of D&D. Fantastic visual look at the history of D&D. They rolled a perfect twenty on this one. In 1974 Gary Gygax and Dave Arneson created a different type of tabletop game. Dungeons and Dragons became the world's first and most popular roleplaying game. For thirty-four years it ruled supreme and unchallenged, until a problematic fourth edition and the rise of the rival Pathfinder game knocked it off its perch. However, with its fifth edition the game has regained its crown. A key ingredient to the game's success has been the phenomenal roster of artists who have worked on the game for al In 1974 Gary Gygax and Dave Arneson created a different type of tabletop game. Dungeons and Dragons became the world's first and most popular roleplaying game. For thirty-four years it ruled supreme and unchallenged, until a problematic fourth edition and the rise of the rival Pathfinder game knocked it off its perch. However, with its fifth edition the game has regained its crown. A key ingredient to the game's success has been the phenomenal roster of artists who have worked on the game for almost forty-five years. 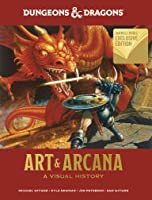 Art & Arcana is a visual history of the Dungeons and Dragons game, taking in every edition and campaign setting the game has produced, as well as many of its novels, calendars and video games. Artwork from the very first prototypes right through the latest 5th Edition expansions and modules is featured, along with lengthy histories and interviews with key personnel. 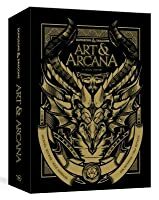 Arts & Arcana is massive: more than 440 pages in length, it features over 700 separate pieces of artwork along with a significant amount of text detailing the history of the game in some depth. It starts with Gygax and Arneson playing miniatures wargames in Wisconsin in the late 1960s and rapidly hitting on the idea of moving from large armies of lots of figures to small parties of just a few figures exploring dungeons, and later wilderness and towns. Dungeons and Dragons was born, with Gygax and Arneson founding the company TSR to sell it all over the world. From there the game exploded, selling millions of copies and inspiring spin-off novels, board games and a TV show. Several times the management of the game became fraught and complicated, with Gygax forced out in a corporate takeover and TSR later collapsing before being rescued by Wizards of the Coast. The game's struggles in the face of competition from video games and card games such as Magic: The Gathering are also documented, not to mention the attacks on the game in the press by fundamentalist Christians in the 1980s. The book brushes over arguably the game's nadir, the problematic 4th Edition (2008-13) and the rise of rival products to challenge the game's supremacy, but it does end strongly with the game's return to recent prominence in a new era of podcasts, YouTube videos and Twitch streams. The one constant throughout the book is artwork. The initial artwork for the game was simplistic, sourced for very little money from whatever artists were on hand. As the game boomed in sales, so the quality of the artwork increased dramatically, with iconic artists like Larry Elmore, Clyde Caldwell and Keith Parkinson joining the company. Later on younger artists arrived with radically different styles, ready to reassess the game for its later editions. As well as artwork for the core game, they also produced art for tie-in novels and video games. The result is a splendid coffee table book and the perfect gift for a fan of Dungeons and Dragons specifically or fantasy artwork in general. In fact, it's a tribute to the artistic strength of Dungeons and Dragons that so many brilliant pieces of artwork aren't even in the book, as there wasn't enough room. In fact, that's probably the book's biggest weakness (along with the somewhat dry and mostly controversy-ducking text): the sheer amount of material produced for D&D over the past forty-five years means that some elements get fairly short shrift in this book. Ravenloft feels a bit hard-done by in particular. There's also, somewhat bemusingly given their prevalence in and for the game, very little material on maps, although perhaps there's enough material there for a completely separate book later on. See raamat on üle 400 lehekülge mõõduka saatetekstiga D&D illustratsioone läbi mitme aastakümne. Mina olen kahtlemata see, kes leiab, et hea illustratsioon/visuaalne abimaterjal annab igale asjale palju juurde - seda juttu, et ükski pilt ei asenda kujutlusvõimet, räägivad inimesed, kellele elevant silma peale astunud ja kes arvavad, et keskaegne Inglismaa näebki päriselt välja nagu Tallinna vanalinn "Musta Noole" filmis. Hea kunstnik oskab sulle näidata asju, mille peale sa ise ei oskaks tul See raamat on üle 400 lehekülge mõõduka saatetekstiga D&D illustratsioone läbi mitme aastakümne. Mina olen kahtlemata see, kes leiab, et hea illustratsioon/visuaalne abimaterjal annab igale asjale palju juurde - seda juttu, et ükski pilt ei asenda kujutlusvõimet, räägivad inimesed, kellele elevant silma peale astunud ja kes arvavad, et keskaegne Inglismaa näebki päriselt välja nagu Tallinna vanalinn "Musta Noole" filmis. Hea kunstnik oskab sulle näidata asju, mille peale sa ise ei oskaks tullagi. Just RPG-raamatute puhul ongi ägedad illustratsioonid üks parimaid asju, ma rohkem seni olen sirvinud küll Chaosium'i Call of Cthulhu raamatuid (aga ka FFG kunagine The Art of H.P. Lovecraft's the Cthulhu Mythos, kus kõik on alati udune ja väga pahaendeliselt süvaroheline ja alati kellegi nägu on hullumeelsusest pahempidi pöördumas). Paraku Art & Arcana on umbes sama üheülbaline, ehk domineerivad üsna ühesugused kangelased, kes üritavad pingutusest punnis näoga mõnele vaenlasele malakaga virutada või sõrmest välgunoolt välja pigistada. Omamoodi lahe ikkagi. Mind see kõik insipireerib (lisaks mainin, et viimastel aastatel on ilmunud minu meelest ägedate visuaalidega nii D&D maailma kui muidu fantasy-koomikseid - nagu Jim Zubi Skullkickers - olen suur fänn - ja Rat Queens,) ja ma olen ise ka kaks korda juba üritanud Call of Cthulhu rollikagruppi käima saada, aga keegi ei võta pikemalt vedu kahjuks. Aga Art & Arcana tõendab, et on ka teisi lolle, kellele need fantasyjoonistuste tekitatud odavad võbinad korda lähevad. Raamatus on veel ülevaatlik jutt D&D frantsiisi ajaloost, selline võrdlemisi tagasihoidlik, tegelikult oli seal draamat palju rohkem. Siiski on see IP mitu korda omanikku vahetanud ja seetõttu ei ole praegune boss (Hasbro) peljanud pihta anda vanadele omanikele (TSR ja WoTC) ja ära märkida, kus nad kõik valesid otsuseid teinud ja puha. Seevastu praegune D&D viies väljalase on ülituus, nii vähemalt meile kinnitatakse, mul eriti vahet pole muidugi (kogu D&D kontseptsioon millimeeterpaberile joonistatud koobastest ja miniatuuridest tundub kuidagi too much effort). Kindlasti on huvitav jälgida, kuidas esimeste väljaannete ikka väga saamatud (sorry) joonistused asenduvad uuemate lahedalt ülepingutatud ja hoolikalt dramatiseeritud võitlustseenidega, mida võib ikka tükk aega imetleda. Ja kuidas algusaastatel lihtsalt osavamate kunstnike motiive oma raamatu tarvis ümber kopeeriti. Oli ka üks episood, kui kunstnik kõigepealt tegi pildid ja alles siis kirjutati lugu ja maailm juurde. Tundub täitsa mõistlik lähenemine, Tales from The Loop nt mis ka ühe mehe maalidest sündis, on minu meelest ka väga lahe. Veidi on juttu ka D&D arvutimängudest, aga keda see huvitab, tasub pigem oodata kuni Bitmap Booksi “The CRPG Book” välja tuleb (nende eelmine raamat The Art of Point-and-Click Adventure Games oli põhimõtteliselt aasta raamat minu jaoks). You should know, just from the title, whether this is a book you're interested in, and if you're interested in this book, you're going to like it. The authors have a good angle here, to review the history of D&D art, which is also the history of D&D. Each chapter is an edition or phase in the life of D&D (from OD&D to 5e, from the Game Wizards at TSR to WotC to Hasbro), with some sidebars on special topics -- the recurring attempt to crossover into video games, the cartoon show (a You should know, just from the title, whether this is a book you're interested in, and if you're interested in this book, you're going to like it. The authors have a good angle here, to review the history of D&D art, which is also the history of D&D. Each chapter is an edition or phase in the life of D&D (from OD&D to 5e, from the Game Wizards at TSR to WotC to Hasbro), with some sidebars on special topics -- the recurring attempt to crossover into video games, the cartoon show (and movies). They also do a nice job looking at some of the iconic intellectual property -- the monsters -- and showing how they changed over time. If there's a problem here, it's that the book is, well, focused on D&D and its history to the exclusion of the wider field. So it mentions the other games that TSR made, but those don't actually show up here unless they intersect with D&D; and the authors note that TSR also was competing with several other companies and their products, but beyond a few mentions, that issue doesn't come up. I immediately began to peruse the book and throughout it has been an amazing trip down memory lane. As I mentioned in previous posts, this is a gorgeous oversiz I knew that Ten Speed Press were working on an illustrated tribute to Dungeons and Dragons. But I must have been sleeping at the wheel, for I had totally forgotten that Dungeons and Dragons: Art and Arcana was about to be released. It's only when the package showed up in my mailbox that I remembered. And what a pleasant surprise that was! Thorough history of the creation and evolution of D&D, from its roots in wargames through acquisitions by WotC and Hasbro, and responses to an ever growing and changing geek culture landscape. With tons of classic artwork, ads, pictures, and spreads showing the many iterations of this or that creature, logo, or character type. I've never gone fully down the rabbit hole; I just poke my head in and look around from time to time (a couple partial campaigns over the years, read some Forgotten Rea Thorough history of the creation and evolution of D&D, from its roots in wargames through acquisitions by WotC and Hasbro, and responses to an ever growing and changing geek culture landscape. With tons of classic artwork, ads, pictures, and spreads showing the many iterations of this or that creature, logo, or character type. I've never gone fully down the rabbit hole; I just poke my head in and look around from time to time (a couple partial campaigns over the years, read some Forgotten Realms novels, played the video games, follow along on friends' campaigns, etc.) So I was surprised how interesting I found this to be. There's a lot of biographical info about key players: Gygax and Arneson of course but also artists, rivals, and important designers and developers. He disfrutado enormemente este libro. Por sus ilustraciones, por la calidad del mismo, por la historia... por muchas cosas. Juega a mi favor que lleve más de 30 años jugando al rol y que mis comienzos fueran con la mítica caja roja de D&D Básico de Dalmau. He vivido casi toda la historia de este juego en primera persona y ver la evolución que hubo al otro lado del charco (desconocida en la era pre-internet) con sus correspondientes ilustraciones, comentarios, evoluciones, fotos de los protagon He disfrutado enormemente este libro. Juega a mi favor que lleve más de 30 años jugando al rol y que mis comienzos fueran con la mítica caja roja de D&D Básico de Dalmau. He vivido casi toda la historia de este juego en primera persona y ver la evolución que hubo al otro lado del charco (desconocida en la era pre-internet) con sus correspondientes ilustraciones, comentarios, evoluciones, fotos de los protagonistas es impagable. This was incredibly heart warming and nostalgic for me. It was good to see what was going on behind the scenes at times because as a hobby enthusiast I knew something was going on. The history is brief and concise and although it is selfish to say, I wish there was more artwork. It was a pleasant walk down memory lane. D&D isn't something I was into as a kid, and in fact I've only developed an interest as my own tween has become interested. This visual history was really fascinating, and I enjoyed seeing how the game and its art evolved into what it is today. A fascinating history! I especially like the pages that show the evolution of prominent monsters/characters. Love seeing how they improved on every edition/made it more playable! Nerd villian (https://1d4chan.org/wiki/Lorraine_Wil...) Lorraine Williams' abominable Buck Rogers campaign setting is the only detail missing. Wonder if it's all the suing.